You can green your home, you can green your smoothies, but did you know you can green your pancakes? I do and they're great! 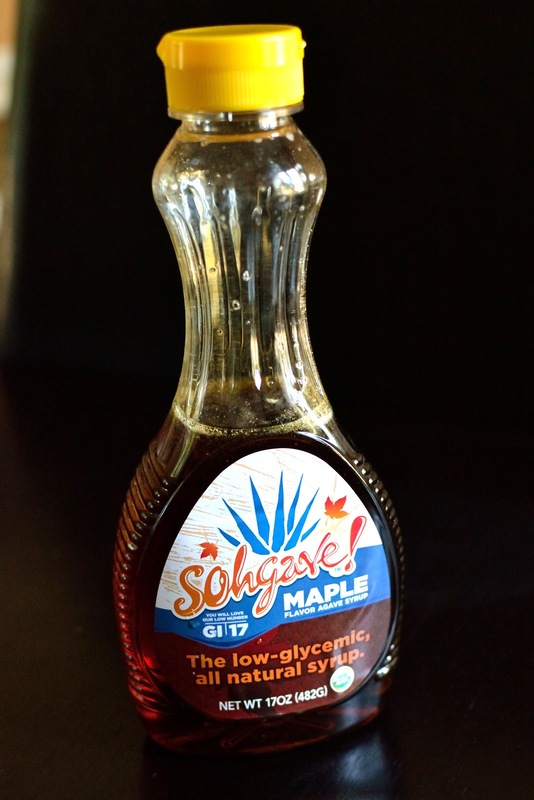 As you may have read before on my blog, you there's two things I love: pancakes, and finding ways to sneak healthy foods into traditionally unhealthy foods. So while whipping up some pancakes one day I thought, "Why not put some spinach in these yummy things?" Well, there was no way I was going to just stir in the spinach leaves...yuck, I don't do spinach whole, it must be a sensory thing for me, I can't do it. So I grabbed my blender and threw the spinach in with the liquid ingredient (rice milk) and blended until it was smooth. I then mixed my "spinach milk" in with all the other ingredients and cooked them just like I normally do. The result? 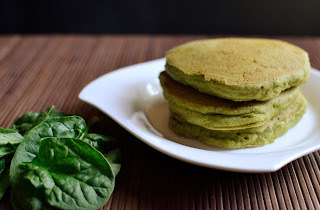 Delicious, normal, fluffy (and green) pancakes! I can imagine what you're thinking, "Me, eat green pancakes? Yeah right." But trust me, they taste exactly the same! Just top them with your usual toppings (butter, syrup, peanut butter?) and you'll love them. This would be a great idea for kids that are picky eaters (I can relate), to sneak some healthy foods into foods they love! The best part of this recipe is that you can use it with any pancake recipe you like. My pancakes are gluten-free and vegan, but maybe you've got a great recipe with buttermilk, whole wheat flour, or straight up Bisquick...whatever the recipe, the spinach can work! 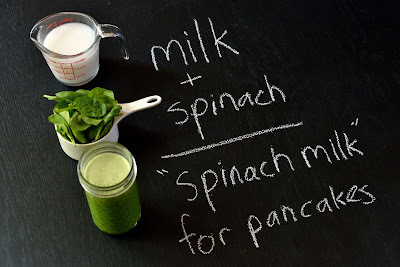 Blend 1 1/2 (or less) spinach in a blender with your main liquid ingredient in the amount called for in the recipe, which in most cases will be some form of milk or water. After blending the spinach and creating a "spinach milk" you can now add the liquid with the rest of your pancake ingredients and cook them as you normal would. Here's a video of me making the "Sneaky Spinach Pancakes". Make sure to watch at the end to see what Avery thinks of these crazy green pancakes! The recipe I use in the video is my all time favorite and can be found over at The Cinnamon Quill called, "Thick and Fluffy Pancakes" that is gluten-free, vegan, and with some modifications, sugar-free as well. 1. Stir together wet ingredients. Whisk in dry ingredients and let stand for 3-5 minutes. 2. Measure 1/4 cup of batter onto a griddle at 280 degrees and cook for 2-3 minutes on each side. In the video I also mention how I use Maple Flavored Agave Nectar instead of syrup...here is the brand I like to get: Sohgave! which you can actually find at Wal-Mart! So that's how I go green with my pancakes. 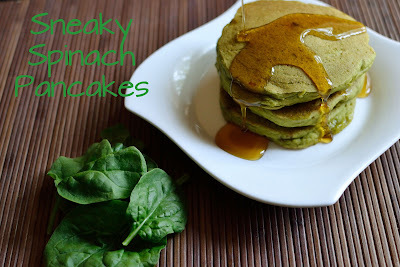 Have you ever tried mixing spinach into your pancakes? How did it turn out? Or feel free to share what else you like to mix into your pancake batter! "Healthy Vegan Fridays" which you can find any of these three blogs: Everyday Vegan Girl, Veggie Nook, and Carrie On Vegan. So get your "vegan on" and check out some of these great recipes! Frugally Sustainable as part of the "Frugal Days, Sustainable Ways Blog Hop." So check it out and find more ways you can go green! 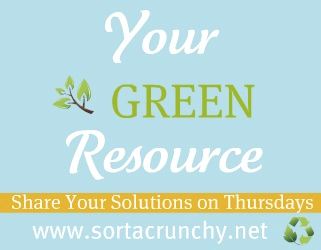 "Your Green Resource" where a variety of bloggers get together and share their green ideas, solutions and resources. You can check out the link up party on any one of their four hosting sites: Andrea at The Greenbacks Gal, Stacy at A Delightful Home, Emily at Live Renewed, or Megan at Sorta Crunchy. There's a plethora of amazing green ideas and tips on these blogs and links so go check it out!